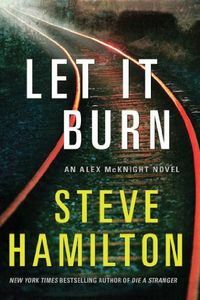 Let It Burn by Steve Hamilton: Synopsis and Online Purchase Options. Synopsis (from the publisher): Even though Alex McKnight swore to serve and protect Detroit as a police officer, a trip to Motown these days is a trip to a past he'd just as soon forget. The city will forever remind him of his partner's death and of the bullet still lodged in his own chest. So he's more than happy to stay in the little town of Paradise, three hundred miles and half a lifetime away. When the sergeant invites Alex downstate to have a drink for old times' sake, it's an offer he would normally refuse. However, there's a certain female FBI agent he can't stop thinking about, so he gets in his truck and he goes back to Detroit. While there, he's reminded of something about that last case, a seemingly small piece of the puzzle that he never got to share. It's not something anyone wants to hear, but Alex can't let go of this gut feeling that they arrested the wrong man.